On first reading, maybe. Using the latest ONS population data, council websites are used disproportionately by the 25-34 and 35-44 age groups. Across the 40 council areas analysed, these two groups each represent 17% of the population (34% in total) but account for 26% and 28%, respectively, of sessions on council websites. The over-representation in the middle of the age bands is mirrored by under-representation on either end. Young adults (18-24) and seniors (65+) use council websites at about half the rate that their population numbers would suggest. Just over 10% of the population in our 40 councils is 18-24, and 23% are seniors, but website usage among these groups is only 5.5% and 10%, respectively. Council website usage among the final 2 groups – the 45-54s and 55-64s – interestingly, is proportionate to the population numbers. The 45-54s make up 18% of the population and the same percentage of website usage, while the 55-64s are 15% of the population and account for 13% of sessions on council websites. There are myriad explanations for what we are seeing. It could be that council websites don’t do enough to cater for younger and older adults. 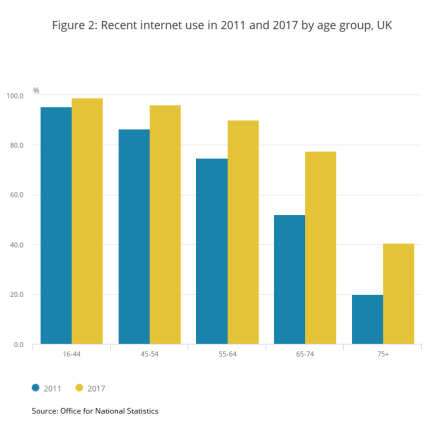 This seems, in part, to be a view held by some councils as I have been told that a key strategy for some web teams is to increase usage among seniors to levels reflecting the proportion of the over 65 population in their areas. But reviewing the data more broadly may call that strategy into question. It could be that seniors are under-represented on council websites simply because they are less likely to use the internet. 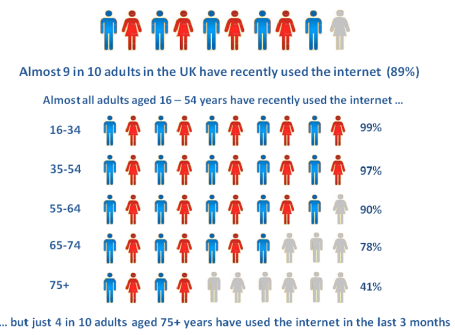 The latest ONS data shows internet usage among 65-74 year olds at just 78%, dropping to only 41% for the over 75s. While making websites more senior friendly seems like a good idea, over investing in this area may hit diminishing returns very quickly. 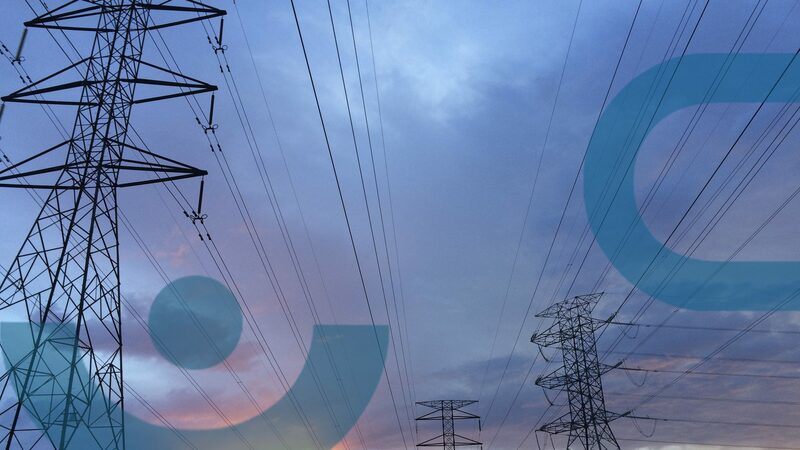 This is particularly the case when you consider how internet usage is changing naturally. Remember, the current 45-54 age group was the first to have access to the IBM PC (and clones) as teenagers, so it should come as no surprise that we see a drop-off in internet usage rates for age groups that were already into adulthood when the computer age really got going. And other ONS data seems to bear this out. Internet usage among older age bands is rising quickest, possibly reflecting entry into those bands of people who were exposed to PCs when they were still relatively young. So it could be that it’s just a matter of time before usage by the older generation is the same or similar to other groups. There may also be completely different factors at play. 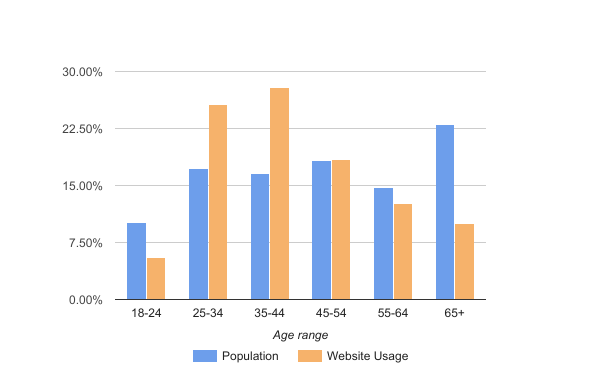 The 25-44 age groups may have more reason to visit a council website than others. Getting married, moving house, applying for primary and secondary school places, caring for ageing parents – the bread and butter council activities are more concentrated during this time of your life. Young adults may simply have less need for council services, and older citizens may be more likely to use their adult children to manage these activities for them. What seems beyond question is that council websites are seeing more activity because they’re getting better at providing citizens with digital access to services. And this trend is almost certainly set to continue. ⟵IS THE UK THE MOST SOPHISTICATED AD BLOCKING COUNTRY IN EUROPE?